"Their finest series was probably the 1959-60 quarter-hours for CBS." ---John Dunning, in "On the Air: The Encyclopedia of Old-Time Radio." Includes jewels from Wally Ballou, Lawrence Fechtenberger Interstellar Officer Candidate, the national tour of Smelly Dave the dead whale, and the classic "One Man's Family" satires, "One Fella's Family." 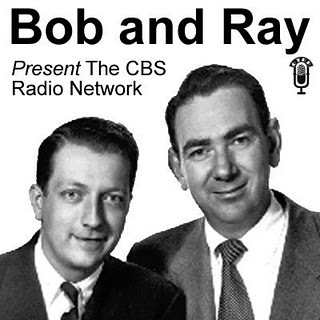 The classic sign-on: "And now, from approximately coast to coast, Bob Elliott and Ray Goulding present the CBS radio network." The classic sign-off: "This is Ray Goulding reminding you to write if you get work. Bob Elliott reminding you to hang by your thumbs."